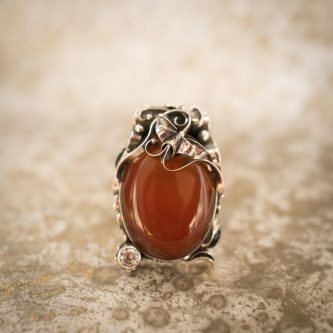 A “self-love” stone, Carnelian amplifies the love for one’s Self, while releasing self-judgement and self-punishment. It carries the consciousness of sensual loving, helping the wearer to awaken their sexuality, sensuality, and attractiveness. It cleanses physical cells, emotions and thoughts by absorbing energy “junk.” It amplifies sexual desire (and helps to achieve orgasms), while releasing jealousy and envy. Emphasizing a positive outlook on life, Carnelian aids in career achievements. Physically, it enhances the immune system, make lungs stronger, clears toxins, helps heal open wounds/cuts/ulcers, as well as heals rheumatism and other inflammations. It also rejuvenates red blood cells.